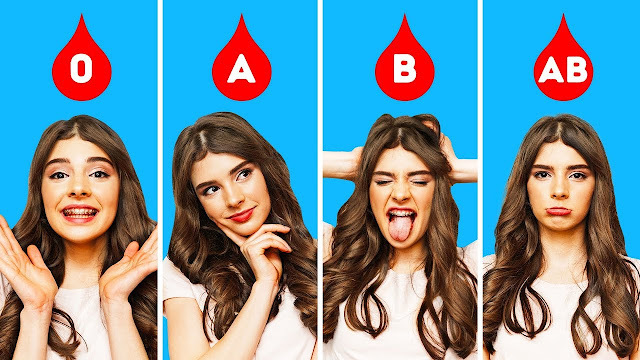 What's your blood type says about your personality? Hey, knowing your blood type can help you improve your health and even save your life in extreme situations. But did you know it can also say a lot about you personally! That's right! Japanese researchers have been studying blood types for decades and have found a surprising connection between a person's character traits and blood group. Are you ready to get to know yourself, on a deeper level? Then keep on reading. We're all well aware that blood has different types. But what exactly does that mean? In a nutshell, blood type is based on two things antibodies and antigens. An antibody is a protein produced by your Bloods plasma, that helps your immune system fight different things that make you sick, like bacteria and viruses. Antigens which are classified as A or B can be different proteins carbohydrates and all sorts of complex biological compounds. We won't get into all that. But just know that the presence or absence of these elements is what gives blood different types. Let's start with the most common blood group. Having this type means you have no A or B antigens on the red cells of your blood. But you do have A and B antibodies in your plasma. The health risks for people with O type blood include ulcers and cholera. Plus they're just Magnus for mosquitos. But what about their personality? Well, Japanese experts call those with this blood type sociable, open-minded, and intuitive. They're real people-people and can quickly become the heart of pretty much any conversation. They're excellent communicators and can find common ground with just about anybody. The only downside is that these folks can come off as a bit self-centered and a little too much for those who don't particularly enjoy socializing. But still, people with this blood type are a real blast to hang out with and will certainly brighten your day. Biologically speaking, having this type means you have only A-antigens on your red blood cells and B-antibodies in your plasma. According to the National Institutes of Health, this means that you're likely to have high levels of cortisol, the stress hormone. There is a certain health risk for this blood group as well. Including a 20% higher risk of developing stomach and other types of cancer and a five percent increased chance of heart disease compared to other groups. Some studies also found that people with A-type blood are less attractive to mosquitoes. So, that's good! As for your personality, Japanese professor T. Furukawa who published a paper on blood types and personality back in 1927, associated A type blood with creative and responsible people, intelligent, and persistent. These individuals know what they want and go for it. They aren't prone to sudden or unreasonable mood swings but are instead laid-back, confident, and relaxed. If this is your blood type then people probably enjoy your presence because they feel at ease. So, just keep on keeping it chill and being a real go-getter. Also Read: What to Do When a Boy Looks at You? If you have B type blood. That means you have B antigens on your red blood cells and A antibodies on your plasma. Although, their groups are sort of the exact opposite. both A and B type people have a higher risk of developing heart disease. And according to one Harvard study women with B type blood have an increased risk of developing ovarian cancer as well. But don't worry if you have this blood type, you have a massive advantage over the rest of us. People with B type blood have up to 50,000 times more friendly bacteria in their body than those with other blood types. When it comes to your character it has pretty much every color to it. That's why Japanese researchers find people with this blood type especially fascinating. You're unbelievably creative, fun, and passionate. You have a true power and strength within you and your energy knows no bounds. At the same, time you can be a little selfish, irresponsible, and unpredictable. Still, people almost always want to get to know you better because they can't crack you and put a label on you right away! So, we are definitely a person with a strong charisma. Then finally let's talk about AB blood type people. You guys have both A and B antigens on your red cells but none of the same antibodies in your plasma. A 2014 study published in Neurology Journal showed that people with AB blood type are generally more prone to having cognitive difficulties as they grow older, especially when it comes to memory, language, and attention span. Personality wise people with AB blood are believed to be rational and a bit controlling. It's not like they're gonna start barking orders at you or anything. They just don't like to depend on others they're the makers of their own fate and they're strong-willed personality certainly helps them along the way. Plus they're really adaptable and know how to make the best out of any situation. Still, they can sometimes be quite critical forgetful and even irresponsible. But we all have our downsides right? In any case, you'll surely find a good friend and an awesome partner in someone in the AB blood group. What's really interesting about the Japanese blood type personality research? Is that they have a certain word for every group. For example, for blood type O, it's rakkanshugi which means optimistic. A-types are called kichomen or well organized. People with B-type blood are called Jikochu which is the Japanese word for selfish and those with AB blood are described by the word kawarimono which means eccentric. Plus, there's even sort of a compatibility horoscope for couples with different blood types. So, if you're in a relationship and you have your eye on someone in particular. Figure out their blood type and give this test ago. Now, if you're both A types, you're probably really affectionate and considerate. However, you can still annoy one another simply because you both have strong personalities. Open communication is your salvation, so don't forget about it. An A type with an O, on the other hand, is a pair of opposites since A's are way more sensitive than O's. As a result, you complement each other perfectly, but sometimes your differences can cause tension. Hang in there and don't let petty fights ruin your bond. This match is different for everybody depending on which side of the AB is dominant. If it's the B side it's very likely that the relationship will have some hurdles to overcome. And if it's the A-side then your time together can be bright fun and smooth sailing. Now, two O's in love is certainly an interesting couple. They're both very straightforward and honest which can either bring them together peacefully or in conflict. Plus, they often bought heads when it comes to competitions of any sort. Still, they understand each other perfectly and can be one of those adorable couples who just love to hate each other. An O/B combo is truly a match made in heaven. O's are very patient which is sometimes necessary with adventurous and free-loving bees. These differences balance their relationship out perfectly and create a strong union. This is one of those pairings that can go either way too. They may have a hard time figuring each other out at first. But with time they can become best friends and loyal partners. If you have blood type B and are dating another B, you just might have found your soul mate. B types connect pretty quickly especially if their preferences coincide. As for this couple, their relationship is pretty private and independent. This is one of those pairings where partner's truly respecting one another and try not to get in each other's way. So, if that's your combo, congratulations! You're most likely in one of the healthiest relationships there can be. Now finally, two AB's make a power couple that everyone else looks up to. Respect, love, passion, and understanding make up the key elements of your relationship. You inspire each other to be better people and act as the other's personal cheerleader. Way to go! So, what do you think? Is there a connection between one's blood type and character? And was your blood type personality description true for you? Tell us in the comments below.